Below is a page of fiddle tunes. Like the songs, they are both arranged alphabetically and numbered. The numbering runs consecutively through the categories. Throughout the pages are numerous informational notes for both the fiddle and guitar. The use of difficult chords is avoided, however some fiddle tunes call for chords such as B♭, E♭, Bm and F#m, which are considered difficult by the authors. 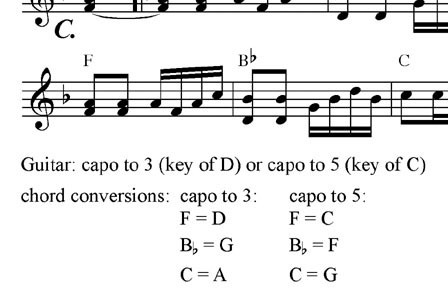 Wherever such chords are required, instructions are given for using a capo so that only non-difficult chords are required. In many cases, two different capo options are given, an example of which can be seen here.